I’m driving east on I-96 towards Detroit. The Dropout, my current podcast obsession is playing through the sound system of my crossover when all of sudden it’s interrupted by my phone ringing. I know why she calling, she has taken a look at the x-ray pictures of my left foot. I was in her office the day prior because I could no longer stand the pain on the bottom of my foot near my toes or the limping. I’m so tired of limping. She tells me the x-ray does in fact show a stress fracture of the third metatarsal on my left foot and she recommends I wear a CAM boot for four to six weeks so it can heal. Even though the news is not surprising, I fight back tears. Not today. Not now. I don’t have time to be laid up or slowed down. The lead up to the boot, as I’ve been calling it, has been months in the making. The first moment I felt a twinge of pain was October. But it was fleeting and I didn’t think much of it. 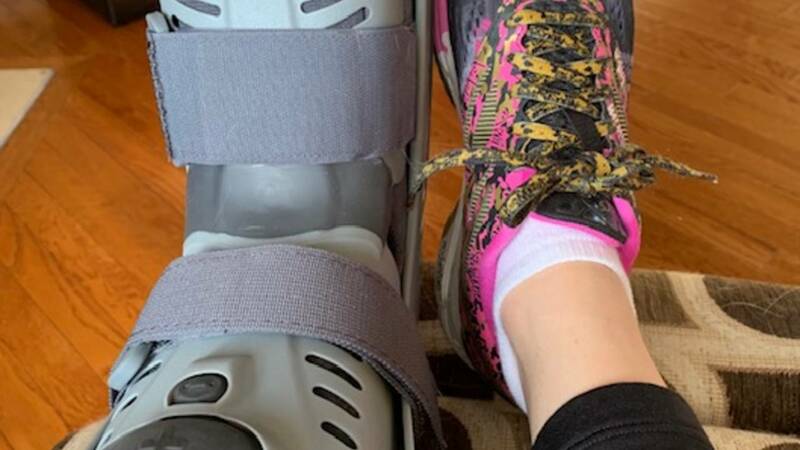 I kept exercising, walking on it, running on it, using my elliptical machine … a few weeks later I felt a pain on the ball of my foot with each step I took. So I stopped running, I stopped using the elliptical machine. I stopped wearing heels. I pretty much stopped everything but walking and my strength class. I put my foot up and iced it. By Christmas I was ready to try running again. After my first three-mile trek, no pain. I waited several days after that initial run and still no pain. WooHoo. That has to be good news right? Then I wore heels to an evening work event. Yep, all night running around field producing in heels. I should have known better. The next day, the limp was back. Oh boy, was it back. So I stopped everything again. I put it back up, resumed the icing every night. It improved, but only a little. That’s when I should have called my doctor. That’s when I should have been more cautious. I was still exercising, still walking the dog, and if I’m being honest, I was further injuring my foot with every step I took. Then in early February I did an overnight museum outing with my son and his cub scout pack. Walking around all night on the concrete floors of the museum did me in. By morning, I could barely put any weight on my left toes. I went home, grabbed an ice pack, put my foot up and dialed my doctor to finally make an appointment to see her. “You bought yourself an x-ray,” explained my doctor when I walked her through what I had been doing for the past several months. “Yeah, I know. That’s why I’m here,” I said at the appointment. And the x-ray reinforced what I already knew, I cannot heal this injury on my own. I was foolish to think I could. The CAM in CAM boot stands for Controlled Ankle Movement. Putting my foot in the boot allows me to walk without worsening my injury. Being fitted for it was relatively easy. I slide my foot into the boot, cover it with two flaps of padded material then add a cover over top. Once the cover of the boot is on, I pump up the sides of the boot with air so my ankle and foot do not move when I step. I never owned a pair of Reebox Pumps – remember when those first came out? I guess this is my version. Walking while wearing the CAM boot takes a little getting used to because I rock onto my left foot as I step. At least, I’m not further injuring my body with each step I take. I have to slow down and let my foot rest. That means less walking, no exercise that puts weight or pressure on my left foot, no lifting heavy things, basically give my foot proper time to heal. It’s a tough prescription for me to follow. Ask my husband, I don’t sit still, even when I’m sitting still. At work, I like to get up and walk around. Yet, I’m following doctor’s orders because I want out of this boot! I focus on the positive. It would be easy to feel sorry for myself because it is harder to get around, I cannot do some fun winter sports like sledding, skating or skiing, but let’s be real, life could be SO MUCH WORSE! Having a grateful journal reminds me of that daily. My job connects me to some excellent experts who have become friends over the years. 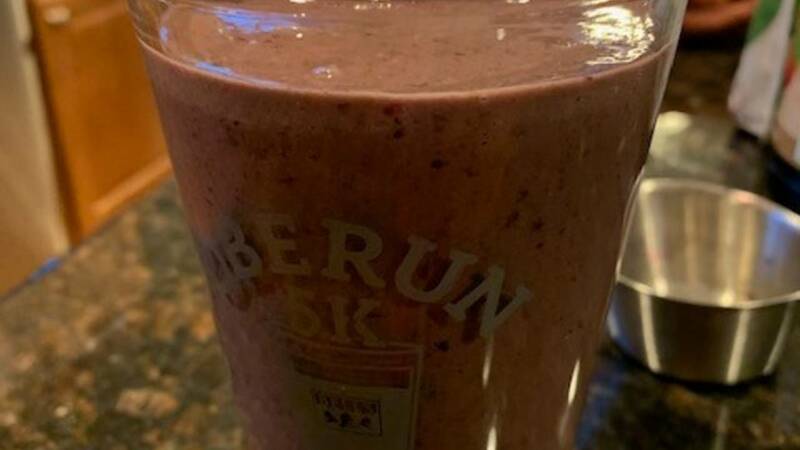 I reached out to registered dietitian, Maureen Stoecklein, who advises the New York Mets on how to use food to not just fuel their bodies but help them recover from intense workouts, games and injuries. She helped me come up with “Operation Exit from The Boot,” which includes a few diet changes to help speed up healing. Upping my protein to 1 gram/per pound of my body weight and spreading that protein throughout the day. Get my Vitamin D checked. If it’s low, supplement with 5,000 IUs a day. Eat micro-nutrients which will help inflammation. This means eating as many colorful fruits and vegetables as I can because they’re high in Zinc, Vitamin E and Vitamin C for healing. Eat fatty fish including salmon and tuna two to three times a week. Include two tablespoons of cherry juice concentrate a day, to also help with inflammation. Per her recommendation, I’ve started drinking a protein shake for breakfast to help get all those nutrients into my daily diet. The shake includes as much spinach as I can handle, and it tastes really good. I’m eating more vegetables than I ever have before and I feel good. And I still can exercise. The instructor at my gym, Hale Strength and Shape, gave me some advice for upper body moves. I also found arm chair workouts on YouTube that are made for people just like me, in a boot! And I work up a sweat – no joke. I’m also on a waiting list for swim lessons. I know how to swim, but this class will teach me how to train my body to swim laps in the pool. 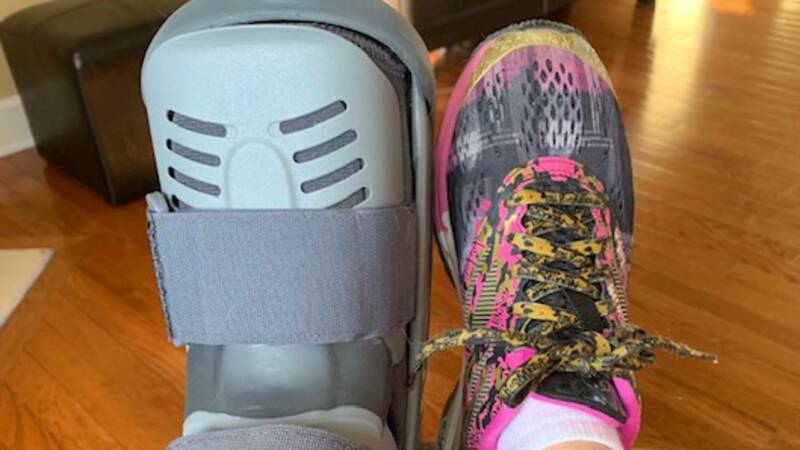 I have a feeling when I finally do get out of this boot, my doctor is going to recommend focusing on exercises other than running. Okay. My brightly-colored running shoes look fantastic up against the grey CAM boot. I just take it all in stride because life can be so much worse, the boot is just temporary.